The Association of Professional Engineers and Geoscientists of British Columbia (APEGBC) relies on the contributions of members from all disciplines to help enrich each other’s knowledge of engineering and geoscience. This year the Association selected the article, titled “Terrestrial Laser Scanning”, published in the May/June 2015 issue of Innovation as this year’s winner of the Editorial Board Award. 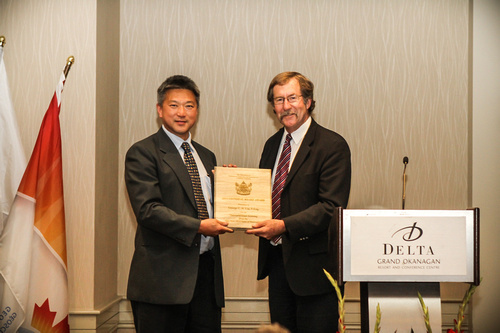 The award was presented to George Liu, P.Eng. by the Association President, Dr. John Clague, P.Geo. on October 17, 2015 at the Association’s Annual Conference in Kelowna, BC.